The ‘Mercurial Collection’ is made up of a handful of popular silhouettes that have been adapted to bold colorways. If we’re talking about popular sneakers, then the Nike Roshe Run cannot be left out. 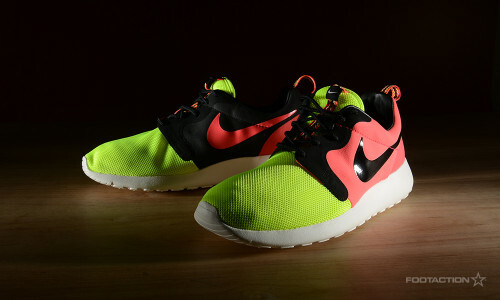 The Nike Roshe Run is a contemporary hit shoe that can now be seen in a funky volt and pink-infused color palette. Broken up by a black surrounding the pink branding, the shoe is capped off with a white sole and midsole. In honor of the spectacle to be arriving this summer with the World Cup, Nike Sportswear channels the past and present of Nike Football to create this new collection. Available in select stores and online. Check out Release Locator for stores. Print article This entry was posted by hhcblog on June 12, 2014 at 11:36 pm, and is filed under Footwear. Follow any responses to this post through RSS 2.0. You can leave a response or trackback from your own site.